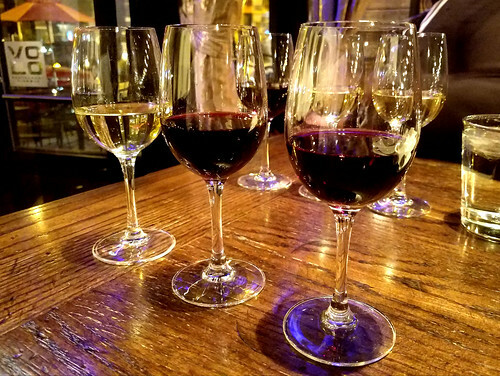 During planning for restaurant outings to sample wines and cheeses, I received a recommendation for a wine bar along a hidden stretch in Chicago’s Roscoe Village neighborhood. A bit rustic in the look and feel with plenty seating, I had a midweek reservation for an early meal. Volo Restaurant and Wine Bar at 2008 W. Roscoe Street was the landing spot. 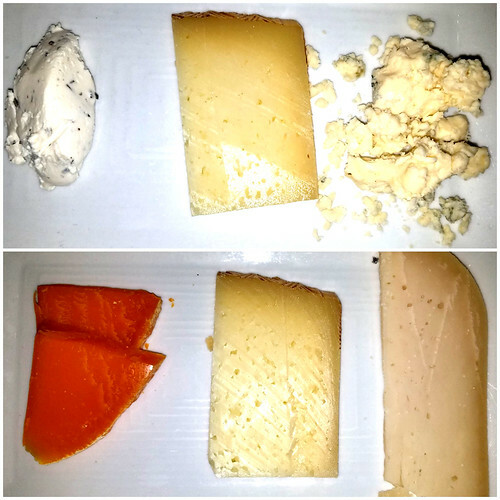 My restaurant adviser and I had designs on trying a few cheese flights along with wine flights for pairings. While the flights were not extensive, there were enough for us to have a few samplings. The first wine flight was a bubbly flight. 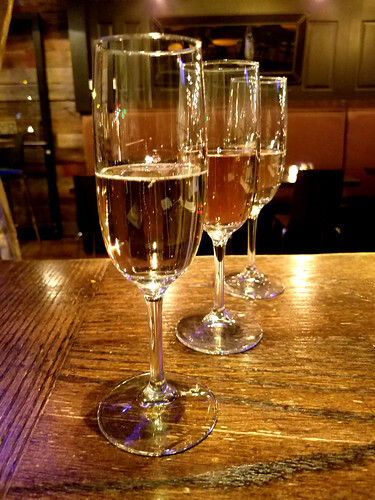 The 2014 Spagnol, extra dry Prosecco from Veneto, Italy, wasn’t dry to the point of inducing puckering and the notes of apple, pear, and bread crust, surprisingly, made for a smooth and balanced bubbly. The NV Jaillance, Cuvée de l’Abbaye Rosé from Cremant de Bordeaux, France, was subtle on the tongue with a faint accent of strawberries and cream. The NV La Vida al Camp, Brut Cava from Cava, Spain, gave a nose of grapefruit and floral notes. With autumn soon arriving, we indulged the fall flight. The 2015 Maison Yves Chaley et Fille, Haute Côtes du Nuits Blanc from Burgundy, France, played well on the palate with fresh Grannny apple, pear, lemon zest, and floral tones. The 2012 Cantina Bove, ‘Marso,’ Montelpulciano d’Abruzzo, from Abruzzo, Italy, was earthy with a mix of black fruits and herbal tones. The 2014 Arsonist, Red Blend carried us to California with a silky blend of Petit Verdot, Malbec, and Cabernet Sauvignon, bearing notes of blue and black fruits, vanilla, and clove for a spicy finish. We had a nice selection of cheeses to start off the evening along with our first flights. For sheep’s milk cheese, we could not go wrong with the three month aged Manchego from La Mancha, Spain, a fantastic semi-firm cheese with a creamy finish. For cow’s milk cheese, we had a Camembert from France, soft and creamy with a flowery rind and a umami flavor. Another favorite, which was a brie, was certainly an offering that we could not miss. And with a vintage gouda from Netherlands on the menu, there was no way we were going to pass on enjoying that along with embedded, crunchy caramel. Wanting to try something made from goat’s milk, we had a Montchevre garlic and herb from Wisconsin. The mix of roasted garlic, rosemary, and thyme in the cheese worked with the the goat cheese almost playing background. One other cheese that we requested to come to the table as a surprise was one akin to a crumbly gorgonzola, very mild, and quite inviting as with the accompanying candied walnuts, crushed figs, and honey. 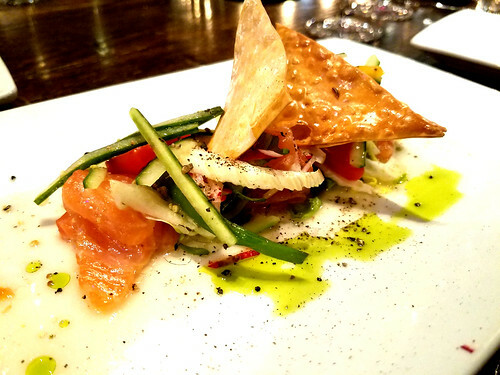 Moving into the small plates, we tried a salmon salad that had a light citrus vinaigrette along with julienne cucumbers and crisps. Slightly reminiscent of a deconstructed ceviche, the salad was a rather nice touch to the finishing sips of our initial wine flights. 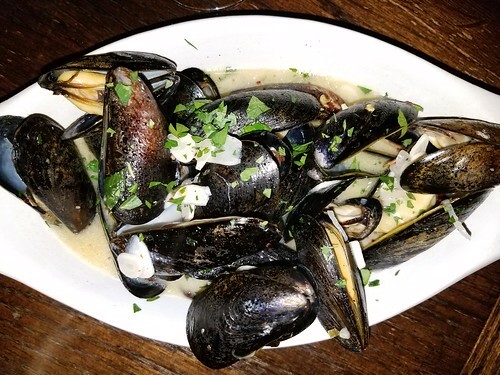 After enjoying this and an allowance for a few minutes, we then ordered a bowl of mussels in a white wine sauce with shallots, parsley and French butter. Very partial towards mussels that come in a saffron sauce, the white wine sauce was ideal not only for the moment but rather fitting given the theme of the wine bar. Having enjoyed the cheeses, salmon salad, and mussels with toast, we had an interest in more flights of wine. Having overlooked it earlier, there was the cheese and charcuterie flight. The 2015 PortoVino, Cardedu, Vermentino de Sardegna Nuo from Saardina, Italy, was herbaceous with a slight edge of minerality. The 2016 Domaine Haut de Mourier, Voignier “Cuvee Stephanie Bouix,” from Languedoc, France, came from a mountainous region with a nose of apricots and peaches followed by pear, apple, lavender, and honey. The 2013 Juris, St. Laurent from Burgenland, Austria, had tones of cranberry, raspberry, and florals, slightly tart, yet a wonderful selection for those who love Pinot Noir. The fourth and final wine flight on the menu was the Pinot Noir flight. 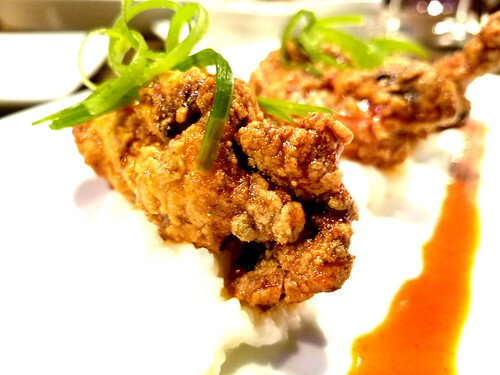 The 2012 Ara, “Pathway” Pinot Noir from Marlborough, New Zealand, was sweet without crossing into dessert wine territory and perfectly spicy, which paired extremely well with a spicy Asian fried chicken dish that came over coconut rice. The 2014 Bouchard Père et Fils, Pinot Noir, from Burgundy, France, had a bloom of cherry, raspberry, currant, and early notes, and unlike a lot of wine with tannins, the tannins in this selection did not overpower the sips. 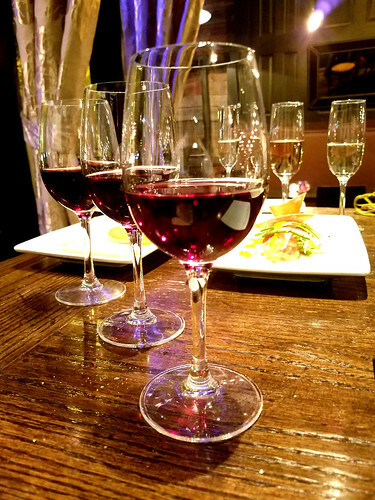 Finishing with a 2014 Rascal, Pinot Noir, from Williamette Valley Vineyards in Oregon, the cranberry, black cherry, and strawberries in this wine could easily make one fall in love with Oregon wines. Finishing with coffee from one of the local roasters, we agreed that the selections were very nice for something light. It was certainly great having a server who was knowledgeable of the wines and could speak to why they paired well with certain cheeses and dishes, as well as speak to personal preference. The wine bar was not teeming with patrons, which may have been due to many in the area crowded into some other bars watching a Cubs game. 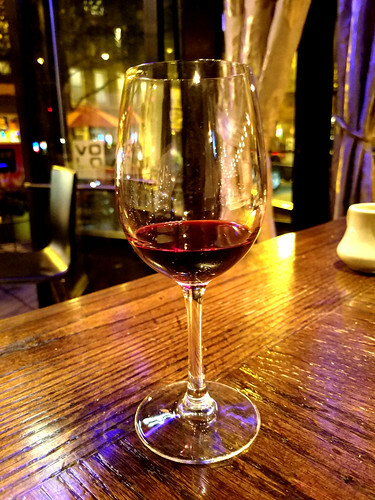 But if you are looking for a nice date spot without the noise and clamoring, Volo Wine Restaurant and Wine Bar is a sweet spot for libations, small plates, cheeses, and satisfaction.